Check out these new features, enhancements and changes introduced in Yahoo Gemini. Gemini now provides you with a new Account Insights tab in the Gemini UI. 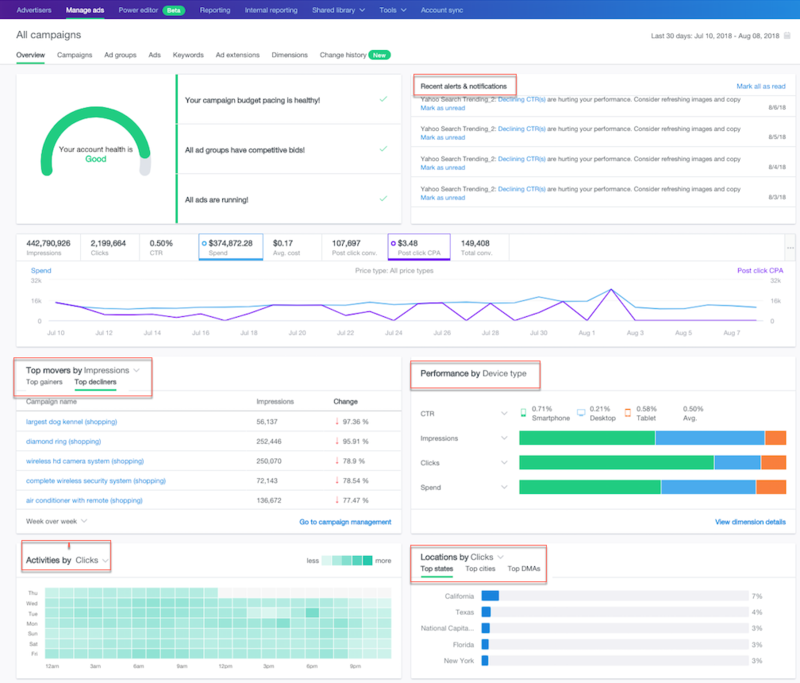 It’s a set of reporting metrics and charts to help you surface everyday native optimization tasks with a few easy clicks, and to discover performance insights at a glance. You’ll gain actionable insights that can lead to greater scale, return on investment (ROI) and improved campaign performance. For example, you can now troubleshoot performance across bids, budgets and ads. Or, view quick snapshots of your campaign top movers, device performance, account dayparting and account location performance insights. And find rejected ads with a single click, ensuring that you stay on top of creatives that need alterations in order to serve successfully. Check out How to Use Account Insights to Optimize Campaign Performance for details about how it works, along with screenshots and detailed examples. Gemini now introduces a new ad format: Tiles Ads in the Gemini UI. Optimized for mobile, Tiles Ads enable you to upload videos, images, and text in the Gemini UI, so you can create a rich, immersive canvas that loads instantly. Tiles ads assets may also be created in Bulk in the Gemini UI. Check out Tiles Ads for details and steps on how you can create Tiles ads using the new Tile builder. Gemini now provides you with enhanced Bulk capabilities in the UI with a Bulk Upload-Download feature. This is a major upgrade to previous Bulk capabilities. It allows users to choose entities to download, as well as provide a custom file name. Check out Bulk Operations documentation for details on the new Account, Campaigns and Ad Groups workflows. You can now use dimensions to look at the most important metrics for your campaigns and adgroups. With dimensions breakouts in tables in the Gemini UI, you can split your data into rows and compare metrics in-line. Check out How to optimize your campaigns. See also View dimensions breakouts for adgroups. You can also now view the total metrics for your campaigns and adgroups. See View Total Metrics for details. Gemini now provides you with the capability to view the history of changes made to your account, thus enabling you to better understand and monitor the changes that may have affected your account’s performance. This new enhancement to Gemini lets you view the changes you’ve made within the last 3 months to your account. For details, see the Monitor Your Account Change History. Carousel ads now support a new video asset. See How to Use Carousel Ads for more information. Gemini now provides you with the option to use deeplinking to drive traffic and improve performance for your mobile ad or DPA campaigns. With a few simple clicks in the Gemini UI, you can enable deeplinking. That means, you can point customers to specific links deep on your website, below the main page hierarchy, targeting your product or people who have already installed your mobile app, either on iOS or Android. To learn more, check out the section on How to Add Deeplinking to your Ad Campaigns.